Sunnyside Cottages are ideally located for exploring the whole of Snowdonia; its mountains, coastline and attractions. These two delightfully presented holiday cottages offer luxury self-catering accommodation in one of the most spectacular regions of Wales. At Sunnyside Cottages we endeavour to make your holiday with us a very special one, a real 'Home from Home' experience. Dinas Dinlle, pronounced Dee-Nas Din-Clare is a small seaside village on the North Wales coast. 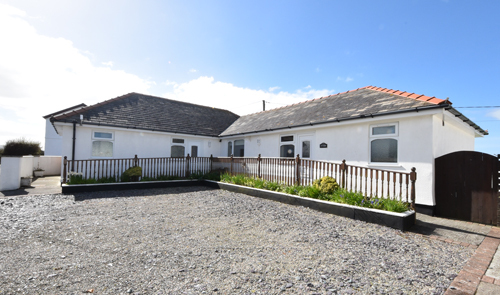 Situated in the beautiful Caernarfon Bay, it has exceptional views towards the Llyn Peninsula and Anglesey in the North and the stunning Rival Mountains in the South. Along with two slip-ways the beach at Dinas Dinlle is a popular venue for water-sports, including wind surfing, jet-skiing, scuba diving, swimming, sailing and power boating and is probably one of the best bass fishing beaches in Britain. Dinas Dinlle has close links with the early Welsh fables known as The Mabinogion. It is said that Lleu Llaw Gyffes a hero of The Mabinogion came and lived at a fortress at Dinas Dinlle and that Dinas Dinlleu was named after him, literally "City of Lleu's Fortress". Off the beach there is a cluster of rocks called Caer Arianrhod which is named after Lleu's mother. On a calm day during the months of May and June, you may be able to witness first hand, the breath-taking site of a pod of dolphins enjoying the freedom of the sea. There is also a Site of Special Scientific Interest (SSSI), and a bird-watchers paradise at Foryd Bay, which is only a short journey away from Sunnyside Cottages. Both cottages have been completed to a very high standard with each benefiting from double glazing and the latest in under-floor heating. All furnishings are co-ordinated and are of excellent quality, giving the cottages a warm welcoming feel. Each cottage comprises of a lounge, kitchen, shower-room, double bedroom, twin bedroom and garden with patio, with access to the cottages via a ramped approach. Each cottage can sleep up to four adults plus cot. The cottages are within easy reach of local shops, cafes and restaurants and are served by regular public transport. Sunnyside Cottages are an ideal self-catering holiday cottage base for those wanting to explore North Wales and beyond. Prices quoted are per cottage per week from saturday to saturday and include all gas, electricity, bed-linen and towels. For the comfort and convenience of all our guests we implement a no smoking and no pets’ policy. Prices quoted below are per cottage per week and include all gas, electricity, bed-linen and towels. Cottage rental is normally from Saturday 4.00pm to Saturday 10.00am. A deposit of 25% of the total weekly cottage rental (minimum £80.00) is required to secure a holiday booking. The full and final balance of a holiday booking must be paid for 8 weeks prior to the commencement of the holiday. Copyright 2000 - 2019 Sunnyside Cottages. Website by io-io.co Copyright 2013 - 2019 All rights reserved.